This tutorial shows how to create a new plug-in that adds a distance tool to the uDig application. The uDig application is built on the “Eclipse Rich Client Platform” that offers an alternative to traditional application framework design. The RCP Platform is customized through extensions that contribute to extensions points. The good news is that everything is consistent, everything from adding a tool to creating an application is done in the same manner. We are going to create a tool that returns the distance between the point the mouse is clicked and the point the mouse is released. This is a quick workbook often used as an introduction to Eclipse Rich Client Platform development. It is the only workbook we offer that provides detailed instructions on how to create a plugin.Subsequent workbooks will treat the topic as review and not go into as much detail. 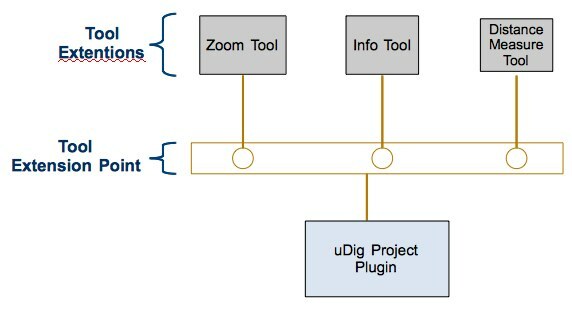 The plugin you create is based on an extension point provided by the uDig project (the tools extension point). The fact that we are using this tools extension point is the only uDig specific part of the tutorial - so if you have a good Eclipse RCP book then this workbook should be considered review. The step by step workbook is only part of the store - here are some additional challenges for you to try. Tools are organized into “Categories” each with their own keyboard short-cut, the Distance Tool is in the category “Information”. Plug-ins have a life cycle (controlled by the Platform class). You can register a callback object called an Activator to be advised when your plugin starts and stops. The start method is used to provide your Activator with a BundleContext (used to access resources like Icons). The ID for your Plugin is used so often that it is worth making a constant in your Activator for others to refer to. This may already be done by the wizard. To enable this, add a .options file to your plug-in next to plugin.xml. The presense of a ”.options” file tells the system that you have trace options available. With the above example of how to use .option file in mind, output your distance results to the console log. You can select the “Information” category by pressing “i”; if you continue to press “i” it will cycle through all available “Information” tools. Try hooking up your tool category to a keyboard binding. The following tips, tricks and suggestions have been collected from the udig-devel email list. If you have any questions please drop by and introduce yourself. One of the key advantages in open source development; is having access to existing working source code to use as a good example. This is especially helpful for the keyboard short cuts; you can study how the i key is assigned to the information tool category; and reproduce those steps for your new category. Putting break points into a line of code you are interested in - is a great way to learn how it works. © Copyright 2013, Refractions Research and others. Created using Sphinx 1.1.3.